What happens when two 'start-up' business brains get together? About two years ago, Sybille and I met at jumpp, an association in Frankfurt supporting women in starting their own businesses. Sybille's business vision with Carpe Futurum is to help shape the future with innovations suitable for everyday use, by keeping an eye on sustainability. My business vision is tied to the world of senses to help increase (product) emotional experience and uncover subconscious emotional reactions. Going beyond the obvious is my motto and I love challenging the senses to get there! Building a business takes time and although it is highly exciting, it is nerve-racking at the same time! Therefore, you want to make sure you get it right from the beginning, don't you? But how many check if their idea is 'future-proof'? Building a business is also challenging and can be very cognitive; business plan, financial plan, marketing plan, target group definition, etc... This can be tough especially for creatives brains! Wouldn't be great to involve more senses and have fun? 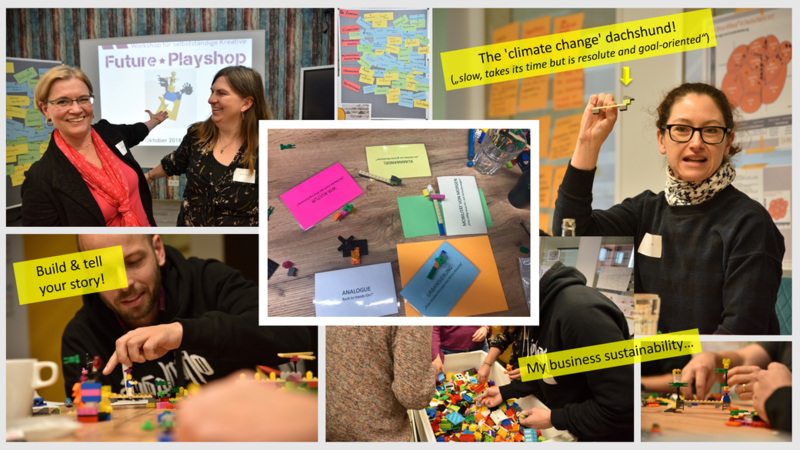 After going through the above process ourselves, Sybille and I decided to merge our strengths into a quick and fun cornerstone workshop for people starting (refining) their business. That's how 'Future & Playshop' was born. The 'Future & Playshop' is seen as a first important step to sparkle new ideas and get your brain to start challenging your positioning. For those who want to go beyond the sparkle and get more in-depth inspiration about future factors/trends linked to their business and/or target group, separate workshops with limited number of attendees are planned for 2019.